Here’s a country primitive perfect choice to dress a rag / cloth doll or teddy bear. Team it over a double pink calico dress or skirt for a complimenting look. An infant baby or doll feeding bib from the late Victorian era. 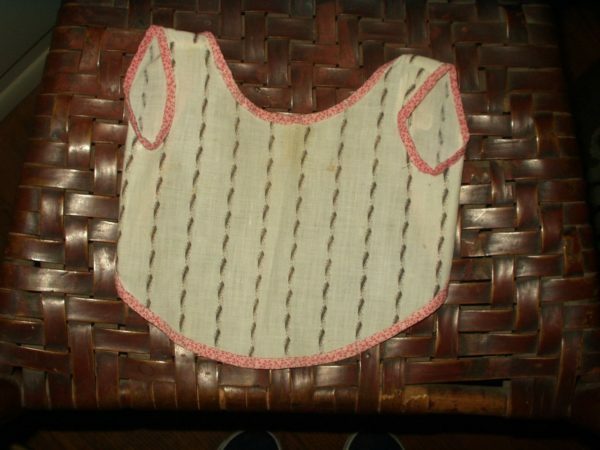 The bib (or apron type bib) is made of a white with black calico. It is trimmed in double pink calico along the neck, front and back opening. Also around the armhole openings. A simple bib which slipped over the arms. No fastenings in the back.